We had massive rain last night. Massive. From about 7pm on. It looked like it was done this morning but a lighter rain recently started falling, so apparently not. Needless to say, things are very wet outside now. 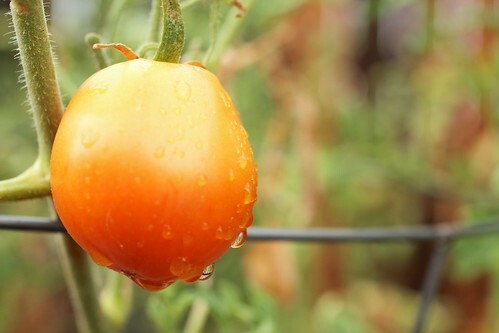 But the single tomato in my garden seems happy. As an aside, did you know that some cell phones - mine, for example - will make a massively loud alert to inform you of dangerous weather issues - say, a flash flood warning - even at absurd times - such as 3am - and will not stop until you acknowledge the warning? I didn't. But now I do. Aside from interrupted sleep, the rain storm also left us with a swollen screen door on the porch (which is on Dan's to-do list to fix but somehow manages to always be pushed down my more important things - especially since it only swells when it rains and, well, this is Texas), a massively tilting pool and a bit of broken fence. And speaking of the pool, guess what I found in it yesterday? Grass! But not just any grass. No, this grass was growing through the bottom. In other news, Gidget has been doing a lot better since I made another follow-up dentist appointment for her. She's regained the weight she lost post-extraction, is eating (quite a bit) more and seems to have stopped pawing at her mouth. So this morning I decided to cancel my appointment instead of making her go through the stress of a road trip and vet office visit. I figured canceling would cause the problem to instantly reappear but it hasn't so far! Four hours and counting - huzzah! I still have to reschedule my dental appointment though. Meh.